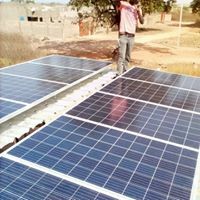 TSO is implementing a ground-breaking renewable-energy project in Burkina Faso, West Africa called the Solar Village of the Future. We have fabricated and installed a modular, solar-powered nanogrid (the “Power Hub”) in the village of Pâ, providing affordable and reliable electricity to villagers so they can pursue economic opportunities. The ultimate goal of the project is to demonstrate that clean energy can be used as a means to poverty reduction. An on-site inauguration ceremony is being held in mid-January 2019 to celebrate the project launch. The artist’s renderings show the Power Hub consists of a solar array installed above a 20-foot shipping container. The container is designed be used for battery storage, office space, and a retail kiosk. There is a shaded communal courtyard in the front for socializing and commerce, and an industrial zone (for agricultural milling) in the back, which will be fenced for security purposes. In late December, 2018, 6.5 kw of clean solar power was enabled and the solar powered milling machines, Wi-fi and remote monitoring are soon to follow. This provides economic opportunities in both industrial applications (e.g., agricultural milling/processing of Shea butter, legumes and grain) and retail services (e.g., Internet connectivity (Wi-Fi) services, device recharging services, and other services). The diverse revenue stream of the retail services helps offset seasonality and variability on the agricultural processing side, creating a viable year-round operation. The primary client for this project will be the Sougrinooma Shea Butter Women’s Cooperative of Pâ Village, which mills its shea (and some grains) manually. We will provide the co-op with three solar-powered milling machines (two for shea and one for flour), which we expect will increase their productivity 10 to 20 fold over manual processing. 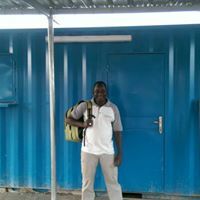 In the next phase of the project, we intend to add a second shipping container and solar array (next to the existing container) to serve as a cold-storage/refrigeration unit. This will provide further entrepreneurial opportunities to Pâ community members, including the storing of perishable foods such as fruits, meat, and grains, as well as the manufacturing/selling of ice and the selling of cold drinks. This project has the potential to have far-reaching implications. Ninety-seven percent of rural Burkinabes live off the grid and ninety percent rely on biomass (firewood and charcoal) as their main energy source. Burkina’s government has no immediate plans to extend its electrical grid services throughout the Pâ district. Once our model has been proven (demonstrating that clean energy can be used as a means to poverty-reduction), it can be replicated in villages across Burkina Faso, and beyond, providing income security and environmental sustainability for future generations of African citizens.